Buffalo’s TeraStation 1000 Series is a compact, budget friendly two or four-drive network storage solution ideal for home offices and professional users requiring a reliable RAID-based network storage, providing exceptional performance during file transfers and everyday NAS functions. 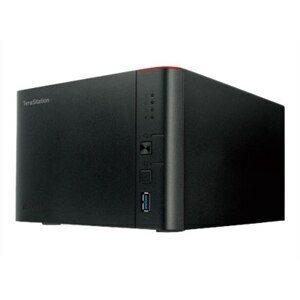 TeraStation 1000 Series is easy to set up with customizable RAID data protection and real-time share level replication. 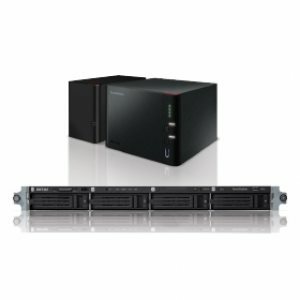 TeraStation 1000 Series is packed with professional features such as Active Directory support, disk quota support, hot-swap hard drives, USB accessory support and eleven licenses of NovaBACKUP®. TeraStation 1000 Series runs on Buffalo's TeraStation NAS System providing a host of business-class features from network file sharing and security to RAID management, remote access and more. Managing data, backups and data sharing in a production environment or larger business is made easy with this NAS operating system. Included on all Buffalo TeraStation devices, TeraStation NAS System simplifies your everyday data needs. TeraStation 1000 is bundled with eleven licenses of NovaBACKUP Buffalo Edition (one server and ten workstations), providing a complete, all-in-one data protection solution for PCs and Windows® servers. TeraStation 1000 offers high capacity, highly available storage accessible among multiple platforms for seamless centralized storage and backup. Create user and group profiles and control folder and file access to protect business critical content and privacy. TeraStation 1000 offers multiple ways to remotely access and share your important data for enhanced collaboration and productivity. With WebAccess and FTP/SFTP servers, you can securely access and share files with anyone outside the local network. Trusted recipients can access selected files from anywhere over the Internet, and with WebAccess files can also be accessed remotely from tablet and smartphone devices. TeraStation TS1000's hot swap feature allows a user to replace a hard drive in the event of failure without powering down the device. Simply remove the defective drive, insert the new drive and the data rebuilds while still being available to clients on the network with zero downtime.